‘Georgie’ was well-known in the village as the grocer’s assistant. He was one of 13 children born to Joseph and Agnes Matilda Hallett from Dorset. The birthplaces of his siblings suggest his family moved around with their father’s work as a stockman. In the mid-1880s they were at Winterbourne Stoke and Bishop Down in Wiltshire, then Greywell in Hampshire. By the 1890s the family was in Berkshire, Georgie was born in Bradfield, between Reading and Newbury, late in 1898, and and his younger sister’s birth was registered in Reading. In 1901 the family was in Chieveley but by 1911 they were living in Datchet. By chance, on the night of the census, all 11 surviving children, ranging in age from seven to 30, were with their parents in Horton Road, Datchet, though some were just visiting. The family home was probably at Hales Cottages which no longer exist, sandwiched between two families of Lewins (who also later had sons and relatives on the war roll). After Georgie left school, he became an assistant at Mr Hepher’s. Albert Hepher ran a grocery shop on The Green in the building which is now The Bridge. Georgie was underage when he enlisted in Slough in early 1917 joining the Training Reserve Battalion. He became Private 28307 in the 1st Hampshire Regiment. We don’t yet have a date for when Georgie was sent to the Front but in late 1917, the 1st Hampshires were at Passchendaele, then in 1918 they were engaged in the First Battle of Arras in March; The Battle of Hazebrouck 12-15 April, including the defence of the Hinges Ridge and Nieppe Forest; and on 18 April The Battle of Bethune. 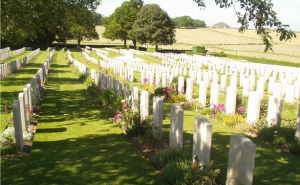 Georgie died of his wounds on 25 April 1918 which suggests he was probably injured at Bethune. A telegram was sent to his parents. In June 1918, Datchet Parish Magazine reported: ‘How the casualty list grows. 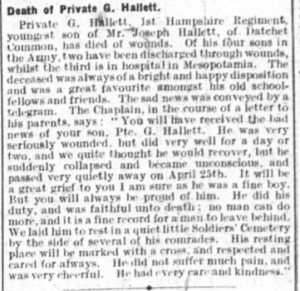 George Hallett, fourth son of Mr and Mrs Hallett of The Common, was well known to us for a long time as an assistant at Mr Hepher’s shop; his, too, was a case of enlisting under the military age – in fact, he was killed before he was really old enough to be serving abroad. He succumbed to very serious injuries; everything humanly possible was done for him, and the parents have received very kind letters from the chaplain and nurse at the dressing station. This particular family has been hit very hard indeed by the war and sympathy is called forth on all sides towards them in their fresh trouble’. Four of the Halletts’ sons had joined the Army, two were badly wounded in 1915 and discharged, a third was wounded in 1917 and still in hospital in Mesopotamia (Iraq) in early 1918, and young Georgie was killed in April 1918. Charles, the Hallett’s third son was reported wounded in the Datchet Parish Magazine of August 1917, joining his two older brothers, Howard and Joseph Harry on the wounded list. The magazine reported that his mother was able to go and visit him in hospital. Georgie’s military records indicate that his mother was given the opportunity to have an epitaph inscribed on his headstone but none was chosen, possibly because they couldn’t afford it. 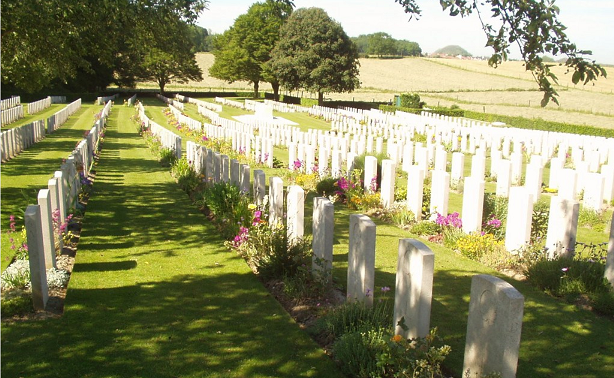 Georgie is buried at Lapugnoy Military Cemetery, Pas de Calais, France. He was awarded the British War and Victory medals. George is also remembered with his brothers, Charles, Henry and Howard on Datchet’s War Roll, the list of all the men who served in WWI.